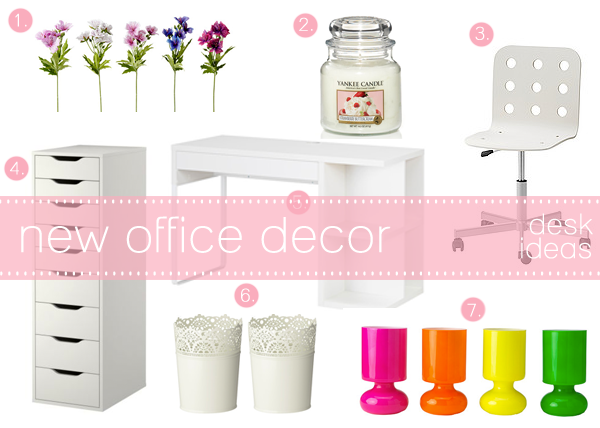 IKEA Office Decor // Desk Ideas + I'm Moving! I have been spending nearly every single day trying to figure out how I'd want to store my makeup and organize in a way that is compact yet not over cluttered. I can finally say I only have 30 or so days left here in Malta as I am moving to the UK on a more permanent basis as my boyfriend and I are moving into our new place. I'm getting on a plane alone which i have never done in my whole life and starting a new chapter. My mum always found me to be very independent and I tend to do things in my own little world. It's an exciting journey but I can safely say I will be just on the outskirts of London. With that being said, our place is unfurnished and so I can get creative. I'm obsessed with Black and White and a POP of colour to brighten up the rooms so it's safe to say, the furniture picked out for the place is all on this scheme. Believe it or not, I made sure I had my own little space for blogging and a space to record my videos and Everything picked out is from IKEA. I love this place and the day I arrive, we are actually going to pick up some furniture straight away as it is something we want to do together and believe it or not my boyfriend isn't bothered at all. SMYCKA artificial flowers £1.50 : I love how flowers give off that "homey" atmosphere. Ikea have alot of different flowers and I would pretty much go for a selection of roses and other flowers. YANKEE CANDLES strawberry buttercream £8.39 : You cannot have a Blogger's Desk without a Yankee Candle. Enough said! JULES swivel chair £35 : Keeping to the White scheme, I chose this chair as it's funky and stylish at the same time. ALEX drawer unit with 9 drawers £85 : This has been on my wishlist for a couple of years now. It's very spacious and in my opinion it is a good investment especially for us beauty fanatics. MICKE desk with integrated storage £60 : I have been obsessed with this desk, I was going for the tiny desk but once I saw this with the storage on the side, I was SOLD! Just to give you an idea I would be adding my Fragrances on the shelves and other pretty products and frames. SKURAR plant pot £2 : I think these are gorgeous little pots, I am planning to purchase one or two for my makeup brushes and another one for my artificial flowers to keep everything looking identical as My makeup brushes will be stored on one of the shelves on the side of the desk. The cut-out pattern on these pots just drew me in and they are inexpensive. LYKTA table lamp £8.50 : It will not be a desk without a lamp and with that being said I wanted a pop of colour and seeing the NEW neon colours I am looking into the ORANGE or the YELLOW. I wouldn't go for pink as my desk will probably be in my bedroom and I am trying to keep it PINK FREE! I cannot wait to have my little space and pretty much experience the Life without my Mum! I feel like I'm doing exactly what she's done moved to a different country just 30 years later and moving back to her home country. I will definitely share my experience with all of you through my YouTube channel as I will probably vlog the whole experience. Good Luck with your new journey! I think it'll be a fab experience! Good luck with everything Stef! I'm sure it will be worth it. PS: Love the picks - wish we had an Ikea store in Malta! Good luck!~ *__* and eee, I absolutely love the "ALEX" drawers, I really want one (or two) myself! Great looking office decor! I was browsing the internet looking for inspiration for my own office at home and I came across this page. Im thinking of a more oldtimey kind of look with a big wooden computer cabinet and a 1950's looking leather chair. I'm not quite sure what to decorate the walls with though; any suggestions?